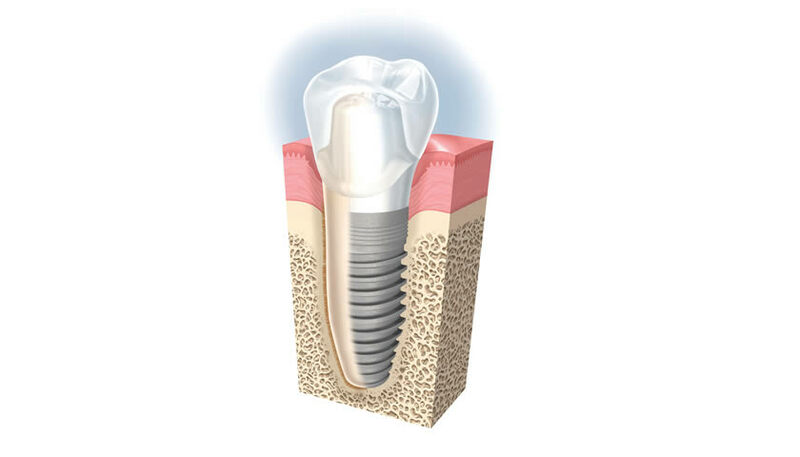 A dental implant is an artificial root which is used as a foundation for a replacement tooth. They are shaped like a hollow screw and are anchored to the jaw bone. Once fitted, they provide the foundation for long-term support of replacement teeth including crowns, bridges or dentures. If just one natural tooth is missing, then one implant is normally all that will be needed to provide a replacement. Larger spaces created by two or more missing teeth do not necessarily need one implant per tooth. However the exact number of implants will depend on the quality and volume of bone at each potential implant site. Occasionally, it is possible to join natural teeth to implants with a conventional bridge. When multiple implants are needed, they can be joined together in the same way that a bridge supported by natural teeth would be designed. The implant will eventually fuse with the bone of the jaw as everyday function stimulates surrounding bone growth, making it become more dense and stronger. Aura Dental, Hervey Bay, offers a full implant service. The team of experienced dentists and staff can discuss options and make recommends to suit individual needs.